As Trump prepares to unleash a new era of fossil fuels and take a hard turn away from renewable energy, a Pew Research Center poll shows that’s not what Americans want. 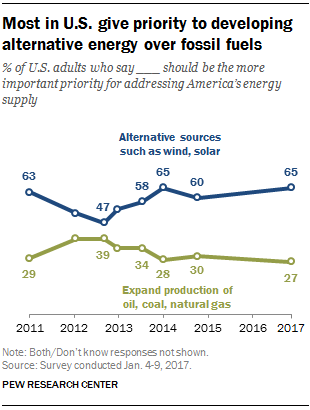 A strong majority of 65% want the US to focus on renewable energy. Only 27% say fossil fuels should be the priority. The divide remains stark between parties, however, with 81% of Democrats and 45% of Republicans preferring renewables. There’s also a generational difference: 73% of people under 49 years-old want renewables over fossils, compared with 50% for people over 50. Two other polls conducted after the election, show that Americans’ concern about climate change is at the highest levels since 2008. 64% are either “very worried” or “somewhat worried”, up from 57% in 2015. A full 70% of Americans say climate change is REAL. Given the constant misinformation from the Right, that’s a big percentage, but climate change is getting harder and harder to ignore. Just about everyone has experienced extreme, scary weather events – there was $53.5 billion in economic damage across 38 states last year from floods, drought and wildfires, according to the Center for American Progress (CAP). Let’s remember, this money comes out of taxpayer pockets. 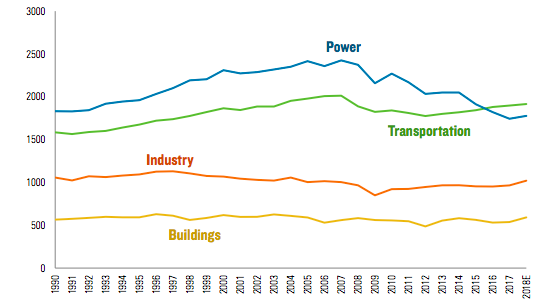 The $53.5 billion represents the crushing damage people are experiencing with increasing frequency – losing their homes, businesses, energy and transportation infrastructure, and agricultural assets. And this number doesn’t include destruction of our natural assets that protect us from climate change, such as wetlands and forests, or even health care costs or the economic impact tied to loss of life. “The Trump administration has a fiscal and moral responsibility to curb U.S. carbon pollution and invest in efforts to strengthen community resilience to climate change effects. If the Trump administration turns its back on this responsibility, more frequent and costly extreme weather events will continue to drain federal, state and local budgets, hurt consumer’s pocketbooks and businesses’ bottom lines, and threaten the prosperity of future generations,” says CAP. “Trump is the president that corporate luddites have dreamed of: the man who will let them squeeze every last cent from their oil and coal reserves before they become worthless …. There is no fair fight that they can win, so their last hope lies with a government that will rig the competition,” says George Monbiot. This is the oil industry’s last hurrah and Trump’s climate denying, oil baron cabinet will do their best to fulfill their role. Unfortunately for them, they also live on this planet and won’t be able to escape from the ultimate damage they cause now.